Are You Having Problems With Your BlackBerry Messenger Remote Back Up And Avatars?!? After reviewing the forums for the past few days, I noticed a lot of users were having issues with their BlackBerry Messenger which was also noticed by DangermouseUK. 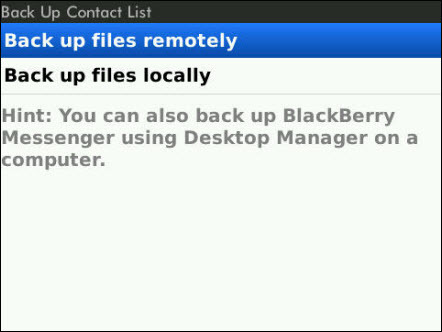 The issues seen in this case is that avatars and remote back up of BlackBerry Messenger contacts is not correctly working. This current situation appears to be affecting not only BIS users but BES users as well. From the information gathered, it seems the issues started as of Friday and have not been corrected since then. Not only are BIS and BES users not able to sync avatars you can't register a new email, restore a backup remotely, and even restoring using a backup file from the PC using device switch or the feature built into messenger, will NOT initiate a PIN switch on RIM servers. This is a confirmed issue and from the information, it does appear that the servers designed to support these features are not responding to the requests to perform the actions mentioned. So I ask you all, anyone having issues with remote back up of BBM contacts? Maybe you have some people on your list who once had avatars and now, do not? Let us know in the comments if you're affected by this.